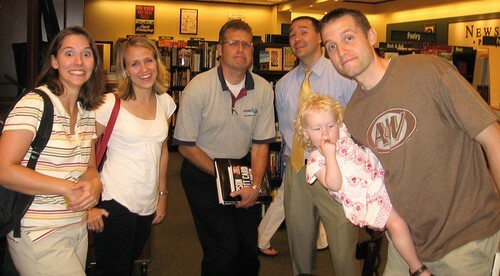 The first signing was at the BYU Bookstore a few days before the book was released. It was wonderful to go back to BYU. I hadn’t been to campus in years. I got Jake a BYU t-shirt and Luke a BYU hat. Campus was even more beautiful than I remembered. Ah BYU. So many memories. Here we are at the BYU signing. Kristine, Scott’s wife; Scott; and me. Notice the BYU bags in the foreground. Scott was kind enough to buy chocolate for everyone who came and stood in line. I thought that very kind. The signing was scheduled to go only for an hour, but it lasted three and a half hours. Most of the people in line didn’t buy a copy of our book; they were there for Scott to sign other books of his, which was fine with me. It was a thrill just to be there. I was really impressed with how kind and polite Scott is with of all his fans. Many of them expressed how much Ender’s Game (or other books he’d written) had influenced their lives, and Scott was touched every time. 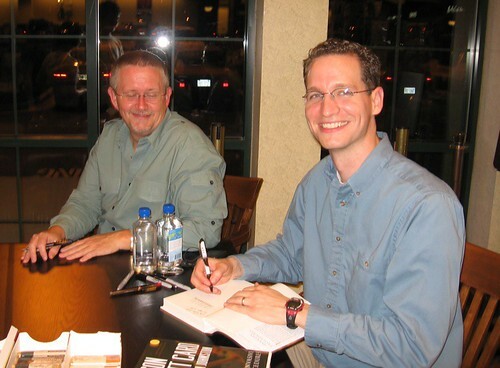 As a fan of Scott’s work myself, it made me love him as an author all the more. He’s really generous with those who read him. 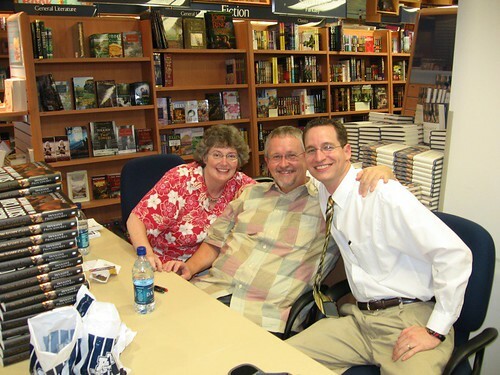 Several of my dearest friends, who I hadn’t spoken to in far too long, were kind enough to come to the signing at BYU. 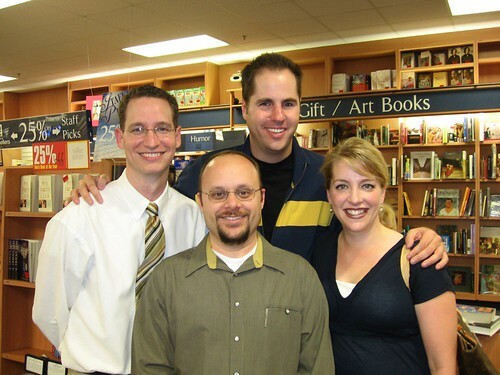 Here’s me with three of them, all were in the the Garrens Comedy Troupe, a sketch-comedy/improv group I belonged to during my BYU days. We were quite the act, if I do say so myself. Pictured from left to right is me, Randy Tayler, Daryn Tufts, and the lovely Lisa Clark. A funnier yet classier group of people you will not find. 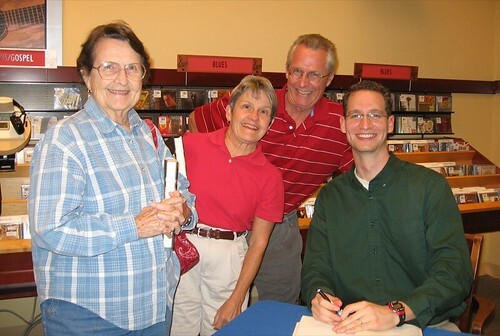 The great thing about the signing in Greenville, South Carolina was that a lot of my friends from work and family were able to attend. Here’s me with Aunt Vickie, Aunt Vonnie, and Uncle Steve. For some reason, the Barnes and Noble in Greenville held the signing at the very back of the store in the music section, hence the CDs there behind us. Here we are at the signing in Greensboro. The Barnes and Noble there did a wonderful job of promoting the event. There was quite the crowd. We sold out of copies of the book, even. It was great. Several of our friends from our Greensboro days came to signing. I thought that a very kind gesture. It was wonderful to see them all. From left to right: Leighanna Lindsay, Shena Arellano, Andy Lindsay, Cheeto Arellano, Ella, and Adam Lindsay.